First off, I'm new to GoldwingDocs and would like to say hello to everyone. It seems like this is a really nice forum with a lot of good people behind it! I need some help with a recommendation for the clutch in my 1996 Goldwing 1500 SE which has a Motortrike conversion. We've owned the trike for about ten years and it has performed great. 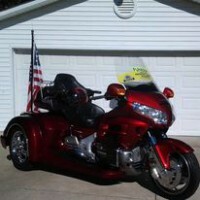 The trike currently has 48,000 miles on it and we had the entire clutch system replaced about 1500 miles ago. Due to the trike's age, even the slave cylinder was replaced as a preventive measure. Unfortunately, the clutch is beginning to slip when under load at highway speeds (i.e. going up a hill at 60 miles per hour). While I have not taken the clutch apart yet, everything appears to be normal. The clutch functions fine at lower speeds and even at highway speeds in fourth gear. It launches normally and drives normally around town. The slippage only occurs when under a load similar to aggressive acceleration to merge on the highway or going up longer hills on the interstate. I also travel light on the Trike and do not pull a trailer. I had a shop do the replacement and was charged $1,400 for the work. Needless to say, I will do this replacement myself. Any recommendations as far as clutches go so that it will hold up to the strain of two up riding on a trike? might want to check the small return hole in the master cylinder. If it gets plugged it holds pressure and the clutch wont fully engage. I replaced my clutch at 130K wasn't slipping just a lot of chatter taking off. No way it could be worn out this quick if it was changed right. Also are you using Automotive engine oil if it has friction modifiers then it's bad for a wet clutch. Thanks Eastkytriker. All parts used in the clutch replacement were genuine OEM Honda. The only oil I use is Honda. It didn't feel like the clutch was hanging up because the revs and mph have remained consistent throughout my ownership. I will double check the return hole in the master cylinder when the weather warms up a bit. I'm thinking the shop may have not done something correctly or they were supposed to do. I thought the stock Honda clutch was plenty strong to handle a trike. What clutch did you use? I replaced mine with a Barnett clutch. I’m sure the Honda clutch is good. Clutches in 1500 are pretty much bulletproof if installed correctly. Everything is pretty straight forward how it goes together. Keep us informed what you find. I can't think of any way it could have been installed wrong and work good for 1500 miles before trouble starts. +1 on the return hole in the master cylinder. I have not experienced that problem, as I flush the system every couple of years, but have read multiple threads on the forum where that was exactly the problem for many folks having such problems. That hole is located under a little metal plate that resides on the bottom of the master reservoir. They say to clear it with a wire brush wire, guitar string, or something similarly thin and stiff. Good luck. Thanks for your help Eastkytriker and Bluewaterhooker0. I will start with the return hole and then go from there. If the clutch is worn, I will replace with a Barnett. 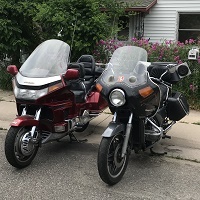 I think I will end up becoming quite familiar with 1500 clutches as I just bought a 97 Goldwing SE for myself yesterday. It seems to be in really good shape with only 28,000 miles. However, the clutch lever has a lot of play in it before activating the clutch. She's low on fluid so I hope topping it off and maybe bleeding the slave cylinder will take care of that. Thanks again! It seems to be in really good shape with only 28,000 miles. However, the clutch lever has a lot of play in it before activating the clutch. Thanks DenverWinger. That's good advice. I think I will definitely do the timing belts on both bikes and check the bushing on the clutch lever. I thought the stock Honda clutch was plenty strong to handle a trike. What clutch did you use? 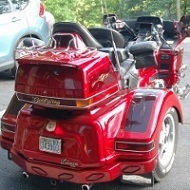 My '97 has Honda clutch and it is a Lehman trike that almost always has two up and often pulls a trailer. Has over 90 K, clutch does it's job. It's been a trike since 1998 and when PO/friend/then dealer did install on what was then his personal GL, he put a new Honda clutch pack in just because, said OEM unit was fine. That clutch has pulled her as a trike for over 70K miles at least. I did timing belts a couple years ago and have replaced that bushing which wears.